Life Cycle Assessment (LCA) is an International Organisation for Standardisation (ISO) technique in the Environmental Management standards series (ISO: 14000). LCA allows for a holistic assessment of the environmental impacts of a product from “cradle-to-grave”. It is a tool used to quantitatively assess the materials, energy flows and impacts of a production system. LCA is increasingly seen as a suitable method of assessing the environmental impacts of aquaculture. This is achieved by assessing the energy and material flows used in the production cycle. The LCA methodology comprises four sections as outlined below. Goal and Scope: Typically defined as 1) analysis of the different processes and associated energy and material flows involved in the production system, and 2) the quantification of the environmental impacts resulting from the emissions (discharges to air, soil and water) related to all of the inputs and outputs of the production system. In general, the scope of the study is from cradle to farm-gate (from egg to harvest). The functional unit of the study is the central hub of any LCA study – it provides the reference to which all other data in the assessment are related (Figure 1). Life Cycle Inventory: The LCI identifies the process steps and environmental flows (materials and energy) associated with each stage of the product life cycle (Curran, 2015). Life Cycle Impact Assessment: This stage of an LCA is where the impacts associated with the lifecycle are determined; LCA software such as SimaPro or OpenLCA often facilitates this process. Interpretation: During this stage the LCI results are evaluated to determine the stages of the life cycle with the greatest contribution to the impacts. LCA can be used to provide policy makers and industry with information to improve process efficiency, and understand which stages of production are performing well and which can be improved. It is an important decision support tool for initiating cleaner production processes and for third party sustainability certification (Aquaculture Stewardship Council, Best Aquaculture Practices, Global Salmon Initiative etc.). 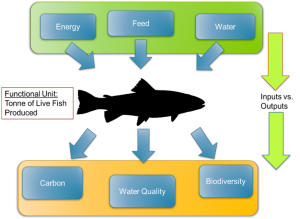 Figure 1: An example of the functional unit used in aquaculture LCAs (1 tonne of fish at the farmgate), it’s associated unit processes and some of the outputs and impacts.